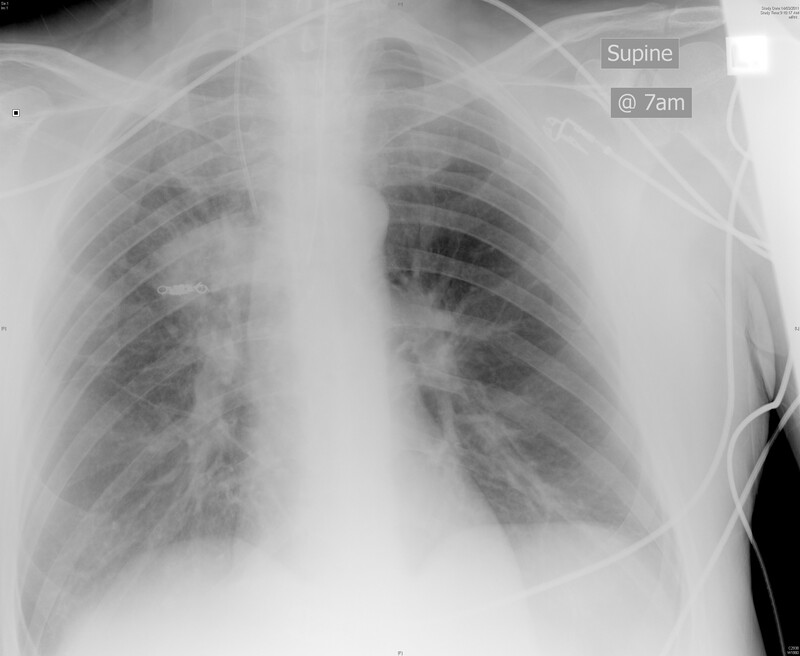 Whilst PE remained on our list of differential diagnoses, we could not ignore the round opacity in his right perihilar region, so he returned to radiology for a CT-Chest…. 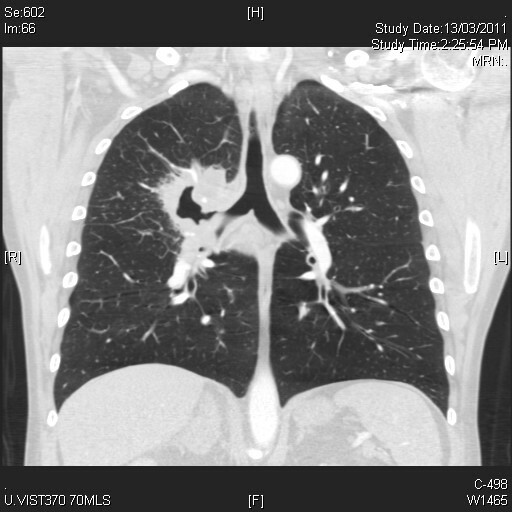 Unfortunately the CT confirmed our worst suspicion, revealing a large right peri-bronchial invasive soft-tissue tumour (of concern is its proximity and tortuous path through and around the nearby vasculature). Approach to Haemoptysis in the ED. The challenge of the Emergency doctor is to ensure adequate oxygenation & ventilation, confirm a pulmonary source of bleeding (mimics include nasal, oral or hypopharyngeal sites), attempt to identify the cause of bleeding through appropriate diagnostic evaluation and devise an appropriate disposition. Most cases of haemoptysis are mild, with blood stained sputum or minute amounts of frank blood, with the most common cause being bronchitis. Vascular: PE, aortic aneurysm, pulmonary HTN, vasculitis (Wegener’s, Goodpasture’s), AVM. Haematological: DIC, thrombocytopenia or PLT dysfunction, coagulopathy. Cardiac disease: CCF, valvular disease. History & examination will be tailored and aims to narrow down to one of the above causes, including basic investigations of bloods (FBC, coags etc) and CXR. Essentially your work-up will take you through to a fork in the road; is the CXR normal or not ? * Both Rosen’s & Tintinalli have good suggestions for these pathways…. 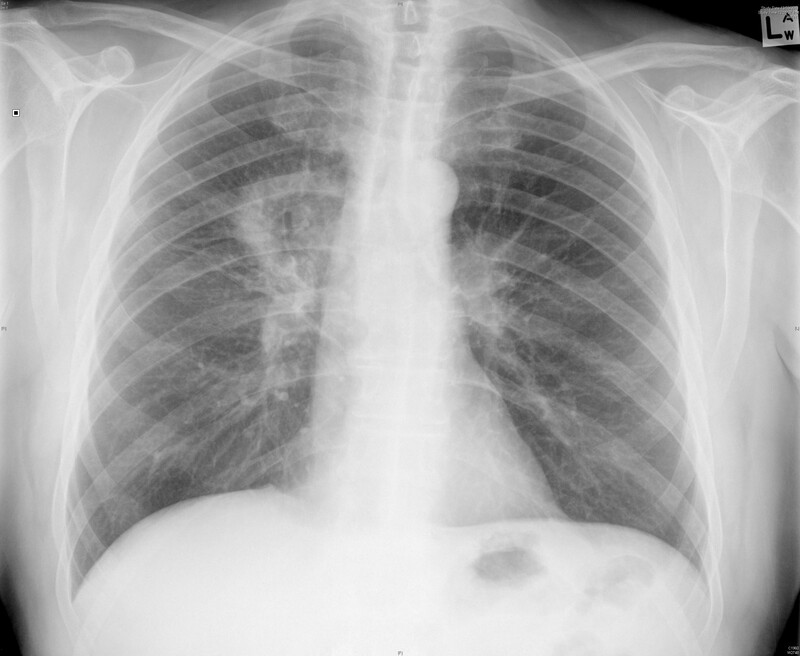 A normal CXR in a stable patient –> no concern for neoplasm — > treat as bronchitis with outpatient followup. 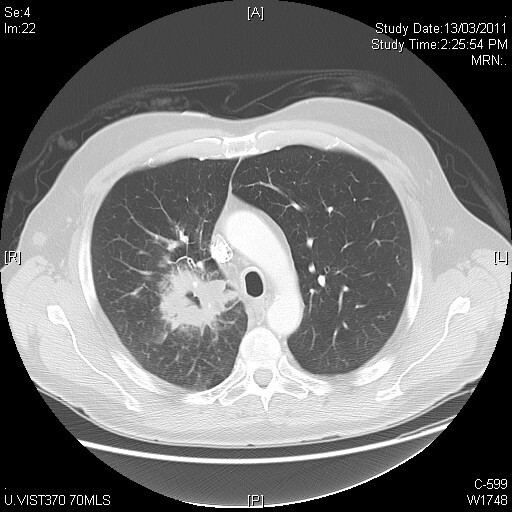 A normal CXR in a stable patient –> ?concern for neoplasm — > inpatient imaging and Respiratory consult vs outpatient CT-Chest with rapid followup (depends on gestalt, patient reliability etc). An abnormal CXR –> inpatient CT-Chest, admission & evaluation. 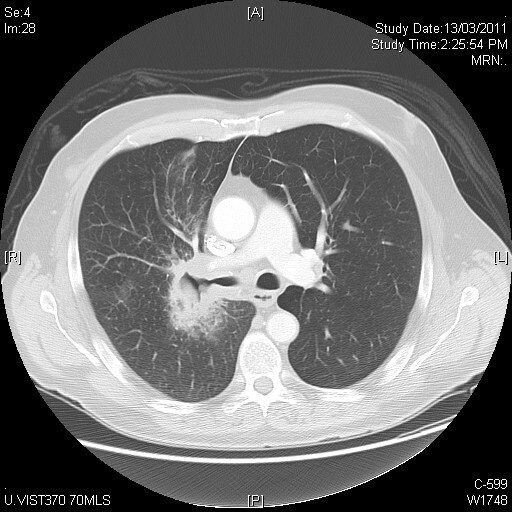 Our fella is admitted under Respiratory with a plan for transbronchial biopsy the following morning…. Arrest call at his bed space. He is holding a vomit-bag to his chin and it is a half full of bright red frank blood (at least 500mL). He looks terrible. Grey, clammy, tachypnoeic, tachycardic. Sats 68%. He is moved to Resus and we set up the airway equipment. He has a hair-raising but in reality uneventful RSI. Induced whilst sitting upright, Grade I laryngoscopy with the Anaesthetic Fellow performing a slick 90-deg anticlockwise turn of the ETT and proceeded to purposely intubate the left mainstem bronchus. He however remains hypoxic on 100% O2. Transfer to theatre for urgent bronchoscopy. Bleeding source not identified, dual lumen ETT placed, 500-600mL frank blood suctioned from LEFT lung !!! 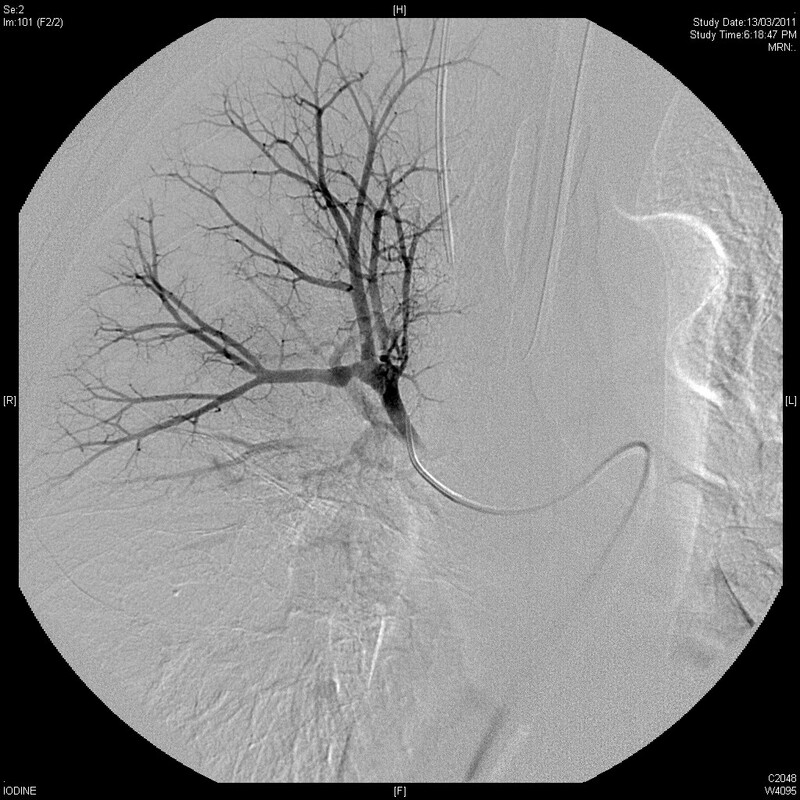 … His tumour had eroded into a bronchial artery which was successfully embolised with a coil. Rare and nasty !! Mortality approaches 80% !! For those working alone or in geographical isolation the approach follows our usual resuscitative algorithm, with early notification to activate retrieval. A. Early intubation (indications include respiratory failure, haemodynamic instability, failure to clear blood), using largest possible ETT (preferably 8.0+ to facilitate bronchoscopy). Selective mainstem bronchial intubation if possible (for lung isolation) (obviously right is easier than left), or placement of double-lumen tube. B. ‘Bleeding lung-down’ position may be helpful, promoting protection and ventilation of the unaffected lung. C. Large bore IV access / Rapid infusers / Massive transfusion protocol. For those at tertiary centres…. this is a ‘all-hands-on-deck’ scenario and from my experience I would strongly recommended getting all the appropriate players involved early !! 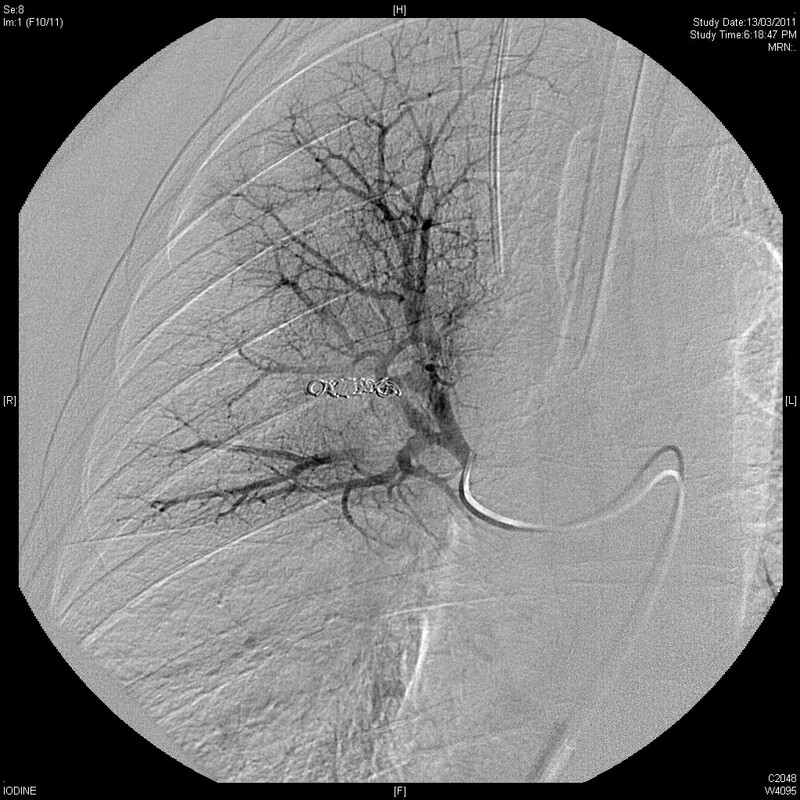 ICU / Respiratory physician: Broncoscopy (balloon tamponade or injection, thermocoagulation). Cardiothoracic surgery: thoracotomy for those who fail bronchoscopy or embolisation. Great post. We had a massive hemoptysis case about a year ago and two ED docs and a bucketfull of nurses couldn’t bring him back. My partner intubated successfully twice–found the bubbles but there was so much blood he didn’t get end-tidal readings thus pulled the tube while I was placing a cordis and did the same thing, convincing himself that he was right, but it didn’t make a difference. Nasty, nasty patient when they are truly massive. Couldn’t get him to bronchoscopy. If there’s any suspicion of truly life-threatening causes, I would tube and bronch early as you did in this case.